First of all, you can get a chandelier trimmed in crystal, hand-forged wrought iron or polished brass. They have the ability to enhance the look of any room, and they have a grand presence as well. If you’re looking for something large, Troy Lighting’s La Rochelle 8-Light Chandelier in hand-worked iron may be the appropriate choice. It is elegant, and it is suitable for a large living room setting. Furthermore, a large chandelier will not take up too much space, especially if you put it in a high ceiling. In addition, we have mini-chandeliers, and the graceful grand chandeliers that will make your home look elegant. You have many options to choose from, such as the traditional, transitional, contemporary or rustic chandeliers. You can decide if you like clean lines, or even a sleek finish. For example, if you are wanting some light in a small space (like a hallway or bedroom) then you should try a mini chandelier. Our “Hubbardton Forge Sweeping Taper Three Light Chandelier” is a good choice, and you will like the traditional look. It has three bulbs, and has a nice teardrop shape top to it. 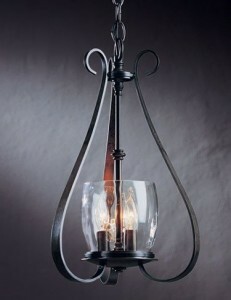 It is available in several finishes, and it has a three-candle-cluster which will give your house a romantic feel. If you’re looking for a small chandelier, it will work well in small rooms as well. They are available in several styles and chain lengths too. Additionally, our small chandeliers are versatile, and they will adjust to a ceiling height in order for you to get the perfect lighting effect. They will work well in a kitchen or small living room, which will create the mood you’re going for. What materials is the chandelier made out of? Where would you like to place it? How much light would you like to emit from it? 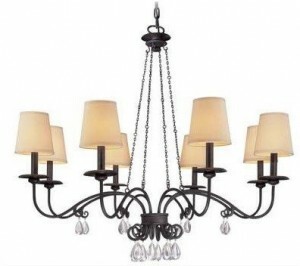 All of our chandeliers serve these functions, so feel free to take a look at our website ( www.crescentharbor.com ) today.